When I posed the question the other day (via Google+) asking about d30 charts you'd like to see, I got a lot of good suggestions. Today's d30 download is one of those suggestions. It was a tough undertaking, and I'm still not sure I'm 100% happy with the results. It's a lot to get into a limited space, and still be roll-economical. I'm thinking that eventually this could be a 2-pager. 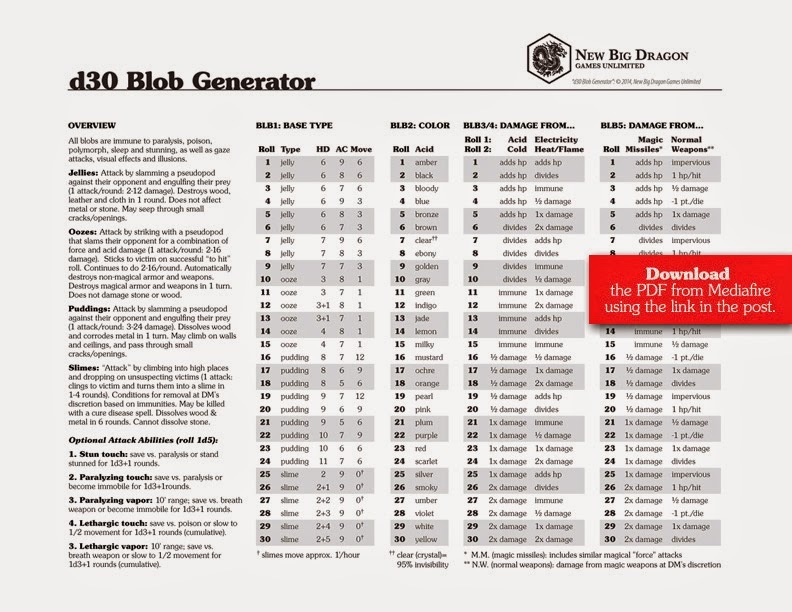 d30 Blob Generator from MediaFire. I can certainly find a good use for this, as there are a lot of these sorts of critters wriggling about in the shadows and what-not of Wermspittle. You do some really useful, and very well organized D30 tables--and a whole lot more! This is a go-to for making sticky things in the dark. Dumb question - what does the -1 pt/die mean, -1 to rolled damage/HD?? -1 pt. per die of damage rolled (e.g., if you're rolling 2d6, then it would mean 2d6 minus 2). This is actually perfect for my current game. Thanks!